Contel’s ruthenium-based derivative could help patients with triple negative breast cancer. Triple negative breast cancer (TNBC) is one of the most aggressive types of cancer—difficult to detect and combat. But Professor María Contel, an organometallic chemist at the School of Natural and Behavioral Sciences, who has been testing metal compounds to combat cancer for the better part of the last decade, was recently granted a patent for a ruthenium-based compound that will help in the fight. This is the second patent for Contel, who is also a professor of the Ph.D. programs in chemistry and biology at the CUNY Graduate Center. Breast cancer affects 12.5 percent of women worldwide, according to a study done for the National Institutes of Health, and it’s the leading type of cancer. In 2012, the last year for which statistics are available, of the 1.68 million cases of breast cancer that were reported, more than half a million of those resulted in death. TNBC, which disproportionately affects younger women in the African-American and Latino communities, has one of the poorer prognoses and worse survival rates. About 12 to 20 percent of breast cancer cases are TNBC. Recurrence is also high. “Because it is a subtype of cancer that does not express estrogen, progesterone or human epidermal growth factor 2 (HER2) receptors, it is difficult to treat via targeted therapies,” Contel says. According to scientific literature, given TNBC’S morbidity, treatment may require what’s known as neoadjuvant therapy, which consists of radiation and chemotherapy to reduce the tumor before it can be surgically removed. “My new compound is nearly 50 times more effective and less toxic to non-cancerous cells and human tissue than platinum-based derivatives,” Contel explains. In addition, at roughly $170 per gram, it is still more inexpensive than cisplatin or carboplatin, two of the most common platinum-based derivatives used for cancer treatment. “And that price is even before optimization,” she adds, explaining that when pharmaceutical companies have to produce industrial quantities of any compound, it lowers costs and prices. Contel, who has successfully used gold compounds to combat other types of cancer, and already holds a patent for other gold-and-titanium compounds used to battle renal cancer, says she had never tried ruthenium until she started working with the late Roberto Sánchez Delgado, a chemistry professor at Brooklyn College who had used the element to design drugs to treat Chagas disease and malaria. One of the great advantages of the ruthenium compound Contel has patented is that it has a long shelf life and is water soluble, which means it could potentially be administered orally. While it clears the patient’s organism rather quickly, it accumulates in the tumor, increasing its therapeutic action. In preliminary pre-clinical trials, Contel’s team found that there was a 56 percent reduction of the tumor in mice. 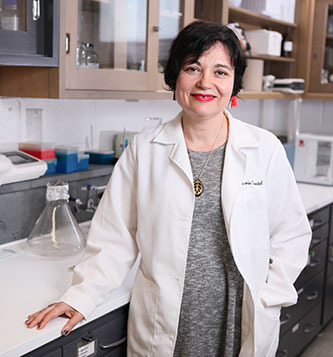 With her in-vitro and in-vivo studies in mice, Contel was also able to determine that the compound she and her team designed, despite being water soluble, “has a certain lipophilicity, which means it could pass through membranes,” Contel says. “We are very hopeful about applying other versions of this ruthenium-based compound to other types of cancers,” Contel says. The National Cancer Institute tested her compound on the standard 60-cell line panel of cancer cells, and it was effective in 49 of the cases. What follows for Contel is applying for grants from the National Health Institutes and the U.S. Department of Defense to do more advanced preclinical work in collaboration with Dr. Karen Hubbard, chair of the biology department at City College of New York. This could last from three to five years and will help determine the compound’s mode of action, which could be helpful for other researchers using related ruthenium compounds. Contel has also been working with Dr. Swayam Prabha, a pharmacologist at the University of Minnesota, to help determine dosages and study the pharmacokinetics and toxicology. If pre-clinical studies are successful, Dr. Aminah Jatoi, an oncologist and researcher from the Mayo Clinic in Cleveland, has expressed interest in conducting clinical tests with humans further down the road. “This is teamwork at its best,” Contel says, adding that it could take up to 20 years before a drug actually hits the market and that it involves several scientists and institutes to make it happen. “I’m particularly proud that my research team—in charge of both the synthesis and the preliminary biological studies—was an all-women team.” Women scientists publish less than men and have fewer patents. “I’m very happy for the support I got from CUNY’s Transfer of Technology Office in applying for both patents. While she continues ongoing research on different compounds, she is also collaborating with Professor Rein Ulijn at the CUNY Graduate Center to develop nano-carriers based on peptides that could improve drug delivery to affected areas. In addition, she is working with Professor Jason Lewis from Sloan Kettering Memorial Cancer Center on antibody drug conjugates to improve the delivery of metal-based drugs for other types of breast cancer.